We are having the mildest winter that I can remember. The only real snow was in October and most of February felt like April. Yesterday was 70 degrees. The spring projects are starting to pile up. We need to fence off another yard for the chickens. The new birds have eaten all the grass down to the nubs, but I think it will come back if we can put the chickens in the new area soon. I will have to put in six or 8 posts and another 150 to 200 feet of fencing. This new yard is where the tractor was working during the excavation for the chicken palace, and there are big ruts everywhere. I want to try to fill in most of those ruts and then mow the tall winter grass down. That is a couple of weekends, right there. 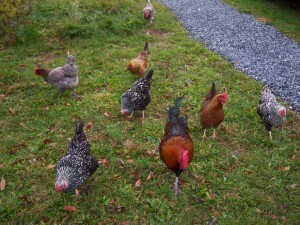 The next project is to build a new nursery coop so we can put a setting hen in a quiet place to raise some babies. We will need to get rid of Tarick the feisty rooster who terrorizes Percy, but seems to lack the instinct to protect his hens. When Tarick is gone we can split up Duran and Big Red and give those hens a break. With the two roosters together the hens are getting pretty beat up. One of the hens has developed a taste for eggs. Not good. I think it is either Pearl or Bonnie or Violet. All three are Marans. They lay the chocolate brown eggs and I would hate to have to get rid of one of them, but we don’t want to let this behavior continue. We want to raise Marans chicks, however, so we will hopefully have a new supply of Maran egg layers by fall. I wonder if that trait of eating eggs is hereditary. 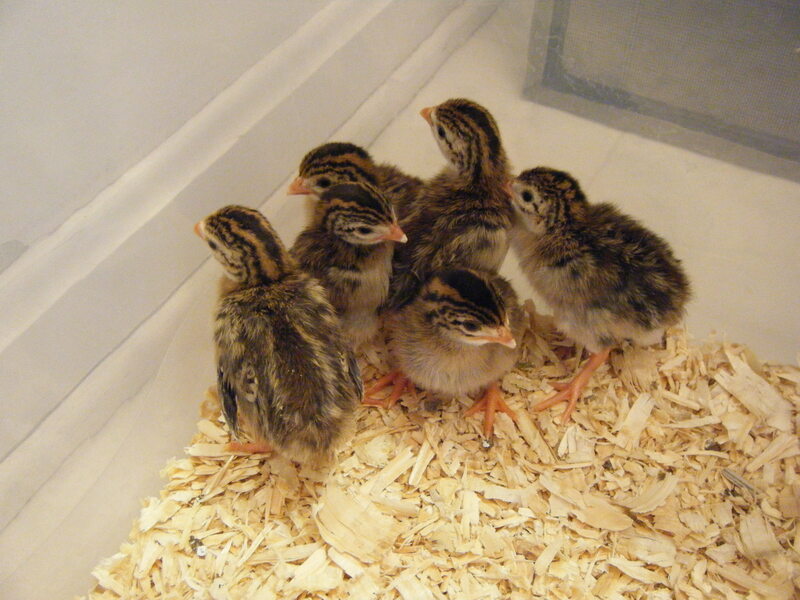 We have seven new peeps arriving around April 8. We are getting three new Ameraucanas, two Brahmas, and two Barred Rocks. 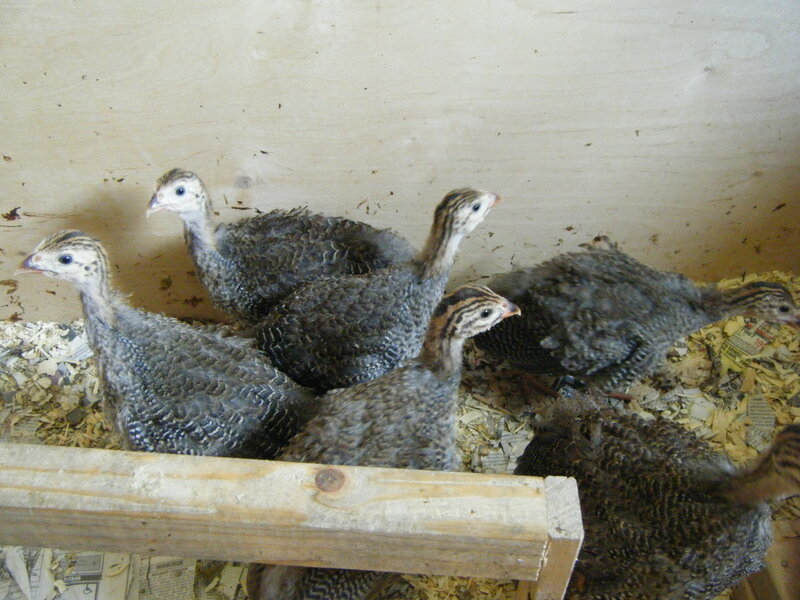 Still no eggs from the guineas, so they must all be males. They are now able to fly over the fence and they wander around, but never go too far away and always want to go back into the coop at night to roost. They are great ‘watch birds’ – squawking at anything new or different – but they are not producing anything of value, except perhaps some fertilizer. Yesterday I did a big spring inspection. 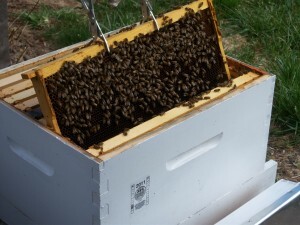 For the first time since adding the second brood boxes to my two hives last summer, I inspected both the upper and the lower boxes. Boston, always the busier hive, had more bees, still lots of honey, some new brood and a little space to expand on the outer frames. I switched the boxes, putting the lower box on top. It was definitely lighter and had more space. I took some pictures as I went and the whole process took about 45 minutes. Because it was 70 degrees, I don’t think the bees minded too much. I never saw either queen, but there was new brood, so she is laying. As careful as I could be, there are still casualties replacing frames and moving boxes around like I did, and I can only hope that the queen is OK. There is always that risk. I didn’t swap the boxes on Anaheim hive, as there was more room in the top box, but I think I will swap them in a few weeks. Because of the warm winter, the new packages coming from Georgia will be arriving this weekend which is a couple of weeks earlier than usual. I still need to put some deep frames together, but otherwise I am ready for them. Because of the early start, I will need to feed them a lot until the nectar flow starts. I am really hoping for a strong flow and good weather during the Black Locust bloom. Losses of hives is typically in the 30% to 40% range, but it looks like my two made it. It’s a little too early to be sure, but unless we get an extended cold snap, I feel pretty good about my hives making it. With the fencing finally up around the new, larger coop, it was time to move some birds from the smaller coops which had become too crowded. We tried moving a few of the older hens but they did not fare so well, constantly being picked on by the established residents and always in a panic to get back to their own flock. I felt so sorry for them that I moved them back. 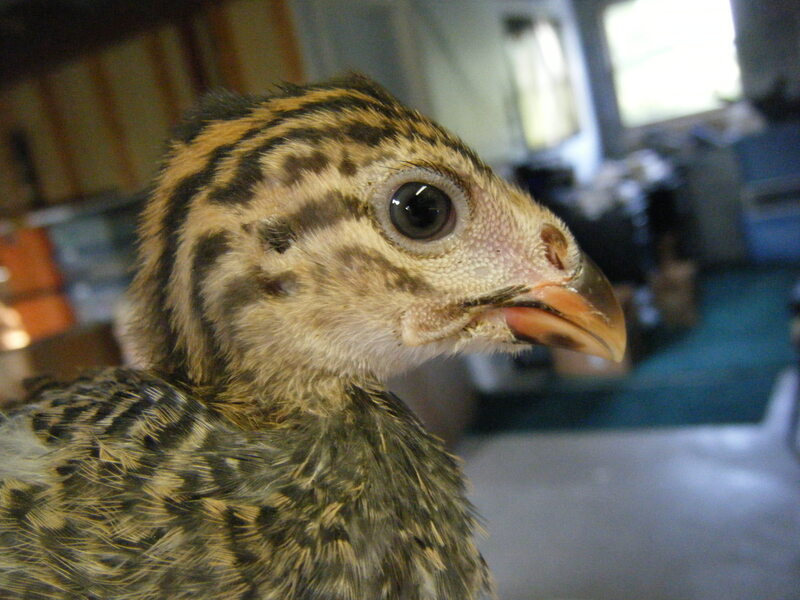 It was always our intention to have the guineas in the new area and allow them to fly in and out to roam as they pleased. 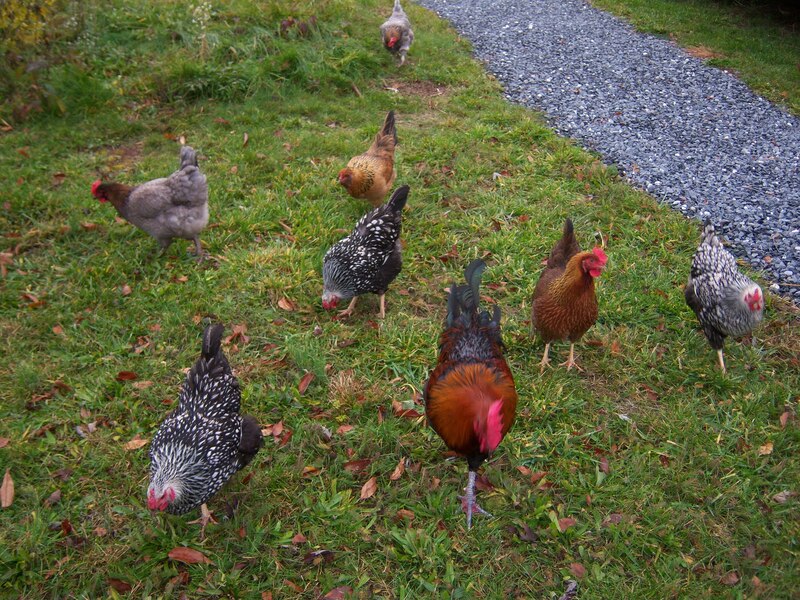 Up until now, they were always in the yard that was covered by netting so we didn’t have to worry about them coming back to the coop each evening. I was not quite sure how to introduce them into the new, uncovered yard and allow them to get used to a new roosting area to be sure they would want to come back in the evenings. We couldn’t just keep them locked inside as the chickens needed to have access to the food and nest boxes. I had been thinking for some time about the best way to accomplish this move. The other night as we were moving the older hens back to their original coop, we came up with the idea of clipping the guineas’ wings to keep them from flying out of the fenced area for awhile, which would give them time to adjust to the new roosting arrangement. The operation ran smoothly, with no major injuries or blood loss (to us or the guineas). They are extremely fast and strong – difficult to catch and can really scratch you up trying to get away. Todd has become quite the guinea wrangler and was able to catch each one in turn and hold it properly for me to complete the wing clipping. They went into the new yard and seemed to settle in fairly quickly. The hens and roosters didn’t bother them since they don’t fit into the chicken pecking order and we found them roosting on the outside perch alongside the original occupants the very first night. I think it will take a few months for them to be able to fly over the fence and by then, they should want to come back to their customary roosting spot for the night. I think I feel better about keeping them in the fenced yard all winter as there are more hungry predators on the lookout for a meal during the colder weather, so we may have to clip their wings once more and let them start roaming next spring. Just what we were hoping for – the guinea keets LOVE stinkbugs! They are finally running to us instead of running away. I don’t think they will ever be as friendly as the chickens, but I do want them to come to us and take treats from our hands. 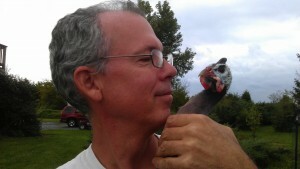 As much as they love the stinkbugs, I’m thinking we need to get a lot more guineas. If they can keep down the population of stinkbugs around here, they are worth their weight in gold! The keets still go into panic mode whenever we try to interact with them, diving into a corner and trying to crawl underneath each other. I tried offering them some small mealworms and they seemed interested, but weren’t brave enough to take them from my hand. I placed a little bowl with about 8 mealworms in it inside their box. One of the bigger keets tried one and immediately gobbled up every worm. This is the favorite treat of our chickens so I am hoping it will be the same for the guineas and they will start eating them from our hands.